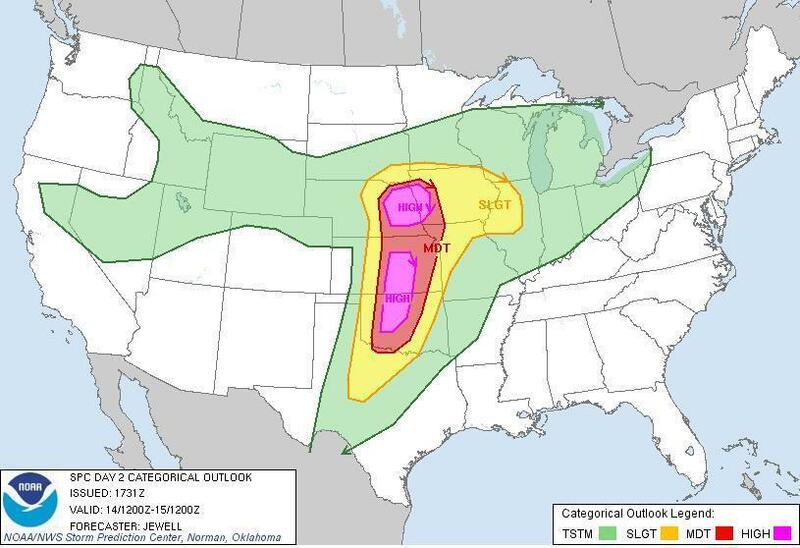 Tornadoes, Severe Weather Likely Saturday Across Nation's Midsection : The Two-Way Dangerous storms are expected from north central Texas up through Oklahoma, Kansas, Nebraska, Missouri and Iowa and as far east as Wisconsin. The darker areas are being warned about what's coming. They're where tornadoes could occur on Saturday and into Sunday. Dangerously strong storms and tornadoes are possible Saturday and into Sunday from north central Texas up through Oklahoma, Kansas, Nebraska, Missouri and Iowa and as far east as Wisconsin, the National Weather Services's Storm Prediction Center is warning. And according to the prediction center, "this is only the second time a high risk has been issued for the ["day two"] forecast, and the first time ever it has been issued for the initial D2 outlook." That's how unusual and how serious the situation appears to be. Iowa — across its southwest, northwest, central and northeast sections. Kansas — across its central and southeast sections. Minnesota — across its southwest, south and east-central sections. Missouri — in its northwest corner. Nebraska — from the southeast across the central section and to the northeast. Oklahoma — from the west to the north-central section (not including the panhandle), and through the center of the state to the northeast. South Dakota — in its southeast corner. Texas — in the northwest, "near Wichita Falls," and across the central section west of Interstate-35. Wisconsin — in the west-central section. "Pre-dawn tornado sirens have sounded in Oklahoma City," The Associated Press reports. Reporter Kurt Gwartney of member station KGOU tells our Newscast unit that storms Friday evening spawned at least one tornado and caused at least 10 injuries across central Oklahoma. The National Weather Service is working to confirm three tornadoes that were reported west and north of Oklahoma City Saturday morning, the AP says. The storms reportedly damaged some homes, but the worst of the severe weather is still expected to hit later this afternoon. "We're quite sure [Saturday] will be a very busy and dangerous day in terms of large tornadoes in parts of the central and southern plains," National Weather Service Spokesperson Chris Vaccaro told the AP. "The ingredients are coming together." Expected during the day, the National Weather Service is now issuing a stern warning for parts of the mid-U.S. to expect the most dangerous weather and possible fast-moving tornadoes overnight. "The threat isn't over with tonight, unfortunately. Severe weather is possible again tomorrow from east Texas and Arkansas and up to into the Great Lakes," Bill Bunting, chief of operations at the Storm Prediction Center, which is part of the National Weather Service, told the AP. Some homes have been damaged in Nebraska, Kansas and Oklahoma from hail and three reported tornadoes, but so far there were no injuries immediately reported in any of the states experiencing heavy severe weather.